The purpose of this change is to enable more dynamic and effective interaction and planning between employees. This must be viewed in coherence with the fact that UiT the Arctic University of Norway has become a multi-campus and is adopting new means of interaction and communication. Change of calendar view for employees is postponed. New date of change will be announced. 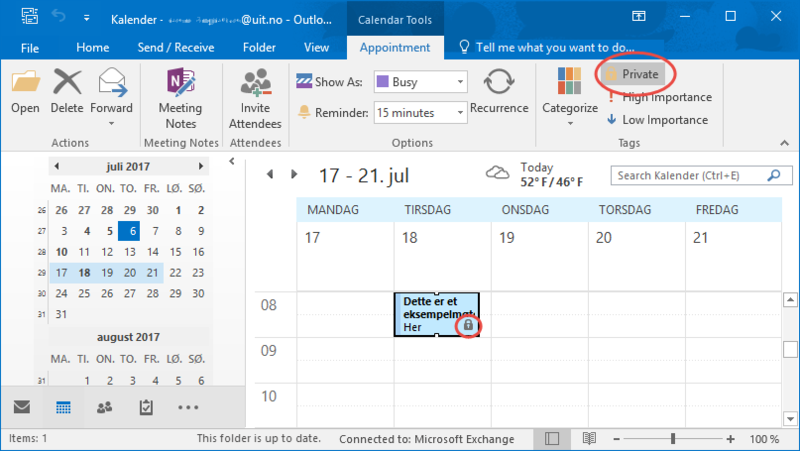 The subject of all your calendar entries in Outlook will be visible to all employees at UiT. 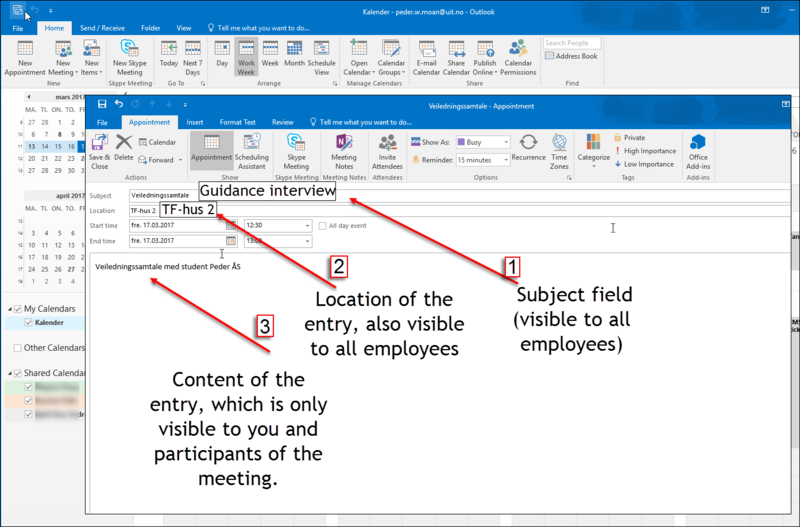 It will no longer say merely "Available/Busy/Absent" but the subject field of the entry itself (for example "Department meeting"), will be visible to all employees. In additon, the location of the meeting will be visible. The content, participants, attachments etc. will not be visible to others than the participants of the meeting (as it currently is). To avoid old entries being visible for other employees, an archive calendar will be created for each employee, called "My archive calendar". This calendar will only be visible for the individual employee. 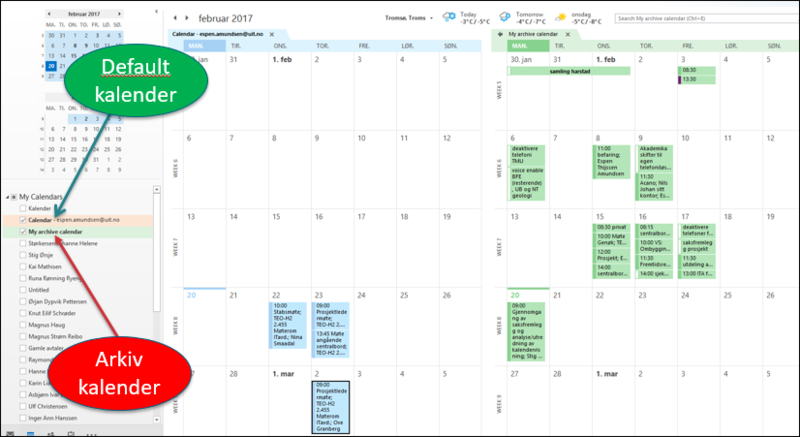 All calendar entries (meetings, traveling, private affairs etc.) from before 30.06.17 (when the change is set to be made) will be moved to your archive calendar. All entries from 01.07.17 and onwards will remain in your active calendar (primary calendar). I.e. you will not be able to see your old entries in your "Default calendar". Picture above: This is what your new primary calendar will look like after the change has taken place. Notice how the subject fields show the entire subject of the entry, and not only availability status. The red box shows you how you can still view your old calendar entries in your "Archive calendar". Notice how you have the option to uncheck the box, to not view your archive calendar at all. After 30.06.17, the subject field (and location) of all your calendar entries will be visible for all other employees at UiT. The contents of the entry, however, will only be available to you. The Outlook calendar should not be considered a safe arena for discussing classified or confidential information,, such as personal and- or sensitive details. This change does not affect that situation, but due to the fact that the subject field will now be visible, we remind you that this type of information is not supposed to be written there. This also includes personal information that you don't necessarily want other colleagues to see. When you create a calendar entry, you have to think about what you put in the subject field. Don't write for example "guidance interview with student Johnny English" in the subject field, but rather "guidance interview" and include more information in the body (content field) of the entry. If you happen to have a private errand, then write "Out of office" or "Busy until.." and rather write what the errand is about, in the content field (for example "dentist appointment"). If you are having a meeting with other employees, be sure to consider what you choose to write, so that no sensitive and- or personal information about them is known (directly or in-directly). This is also a thing that is not considered as something new following the change, but is necessary to be reminded of nevertheless. 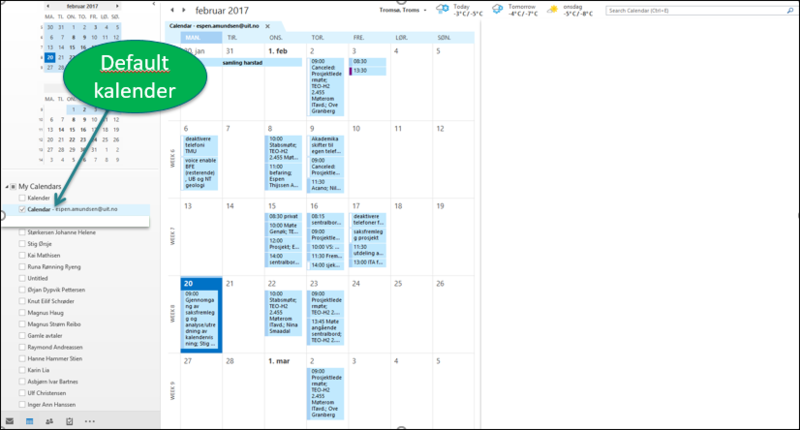 The subject field will be visible for all UiT employees that may wish to view your calendar. Writing "Doctor's appointment" as the subject for the entry, for example, does not necessarily reveal personal and- or sensitive information. The content of your calendar-entry is only available for you alone. In other words, other employees at UiT will not be able to know the reason behind your doctor's appointment. The "Private" tag is respected by most programs/apps, but there are those that do not respect it. The programs/apps that do not respect this tag will show the subject field in its entirety. Because of this, employees are advised not to use this functionality uncritically. Update 13.07.17: Series created before 13.07.17 will have the series split up between "My archive calendar" (Meetings before 13.07.17) and your main calender (The remaining meetings in the series). In other words. You do not have to do anything to make et series work in your main calendar. When you, as an employee, book a flight or hotel stay via UiT's official booking portal (Egencia), you will receive a meeting notice which will embed itself in your calendar. This meeting notice contains a booking reference in the subject field. Once the above changes take effect, all UiT profiles will have this function deactivated. You will need to log in to Egencia's website to reactivate calendar alerts for your booked flights and hotel room reservations. This is due to the fact that your reservation number is displayed in the subject field of Egencia's order replies. You can avoid this by setting your appointment to "private", but this has to be done after you receive the reservation email. Select your name, and choose "Profile"
Go to "Email Preferences" and select "Calendar meeting requests", then save your settings. The directing committee for the project "Fremtidsrettet samhandlings- og kommunikasjonsløsning" (consisting of university director, faculty directors, campus directors and thje IT-director) has decided that Outlook's calendar-viewing is to be changed from having only "Available/Not available", to also show the subject field and also the location.